Holiday house "Mareta" is located in Savar on Long Island, only 300 mt from the sea. Completely newly renovated, nicely and comfortably furnished house in a quiet part of the island and only 3 minutes walk to the beach. Capacity of the house is for 4 guests, with one bedroom with a double bed and with sofa bed in the living room suitable for two people. 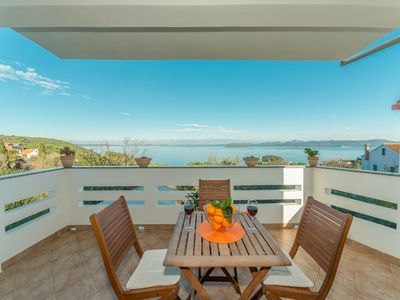 There is also a big terrace with a beautiful seaview and Velebit. Fully equipped kitchen, dining room and bathroom with shower and toilet. The apartment is air conditioned, with WiFi and SAT / TV. Bed linen and towels are also in the house. In the yard is a secured parking for guests, and barbecue station. Complimentary there are also bikes at disposal.